I think life is all about perfect pairings, just like a cup of tea and a good book or the perfect powder to set your favorite foundation. When it comes to skin care, it’s not just about the products that work best for you, but also work best with one another. 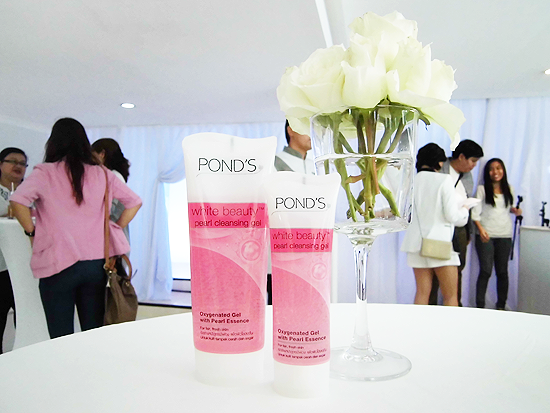 That’s why a long-trusted and innovative brand like Pond’s decided to come up with the new dynamic duo of skin care with the launch of the Pond’s White Beauty Pearl Cleansing Gel facial wash; aimed to not only provide numerous benefits to skin, but to also compliment the effects of their popular and raved about Pond’s Flawless White Dewy Rose Gel. I know what you’re thinking. This whole “gel” thing seems to be a trend, huh? It’s almost like every beauty brand out there, Pond’s included, is releasing or re-inventing some sort of gel product - everything from nail polish, to eyeliner, to face masks. 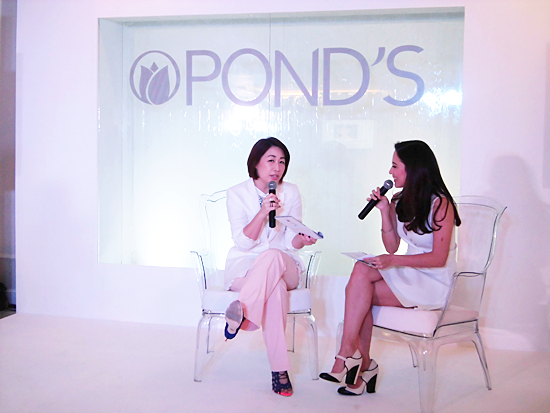 That’s why Pond’s called upon their resident beauty expert, Agoo Bengzon, at the launch to tell us a little more about this fast growing trend, including other hot beauty trends out there right now. 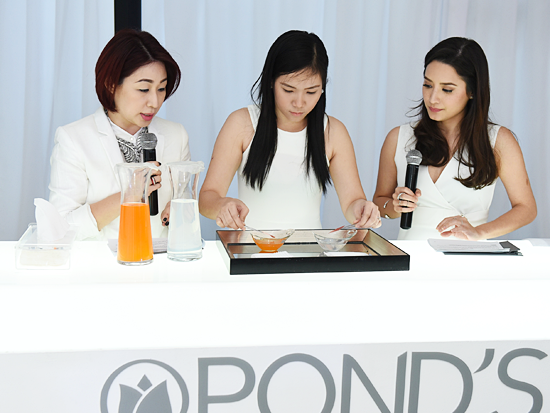 Agoo, along with host for the day and Pond's girl Nicole Andersson, then did a quick demonstration to really prove how well the new product works. Two bowls were filled with different facial cleansers - one with the Pond's Pearl Cleansing Gel and the other with a whitening, Kojic acid soap. 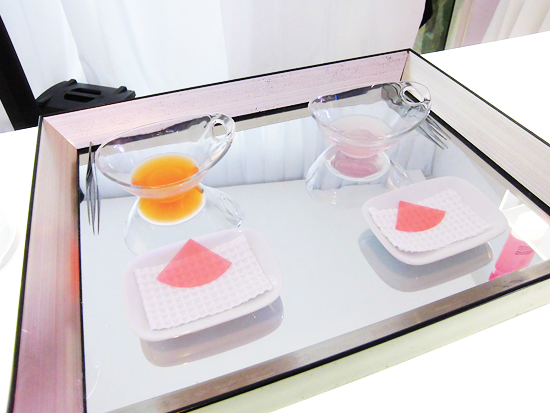 Then a small, pink jelly-like 'sheet' was placed to soak in each bowl for a few minutes. The sheet is meant to represent our skin and is actually made up of or contains the same proteins that we have on our face. When time was up, we all saw for ourselves that the sheet placed in the Kojic acid soap looked like it was already starting to dissolve and break apart on its own because of all the harsh and drying ingredients in it. The color also faded and became dull. The other sheet, placed in the solution of Pond's Pearl Cleansing Gel, still held its vivid color and looked exactly the same when it was taken out, proving that its ingredients are indeed mild, non-drying, and perfect for even those with sensitive skin. Spotted: sisters, bloggers, and Pond's girls Laureen Uy from Break My Style and Kryz Uy from Thirstythought. I know seeing is believing, but I also think 'feeling is believing' and luckily Pond's had sample tubes of the new cleansing gel so we could try it out. Of course I wasn't about to start washing my face with it or anything, so I just squeezed some of it out onto the back of my hand. It's a thick gel, but easy to spread around. I think it smells lovely too! The scent is quite strong, and it instantly reminded me of roses, but I find it very 'fresh' at the same time. I just hope it's not too overwhelming once I properly test it out for myself. 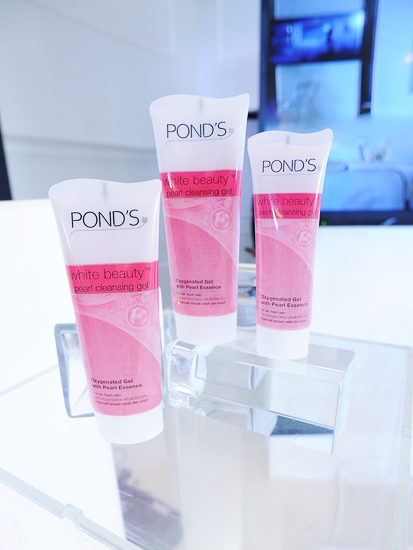 Guests at the event already had initial thoughts about the new cleanser, but what do some of the Pond's council members who already tried and tested the product think about it? According to Laureen Uy, "What I loved about the new Pond’s Pearl Cleansing Gel was that after using it for several nights, it didn’t leave behind a rough texture that regular facial soaps normally do. Instead, my skin felt very smooth and clean." 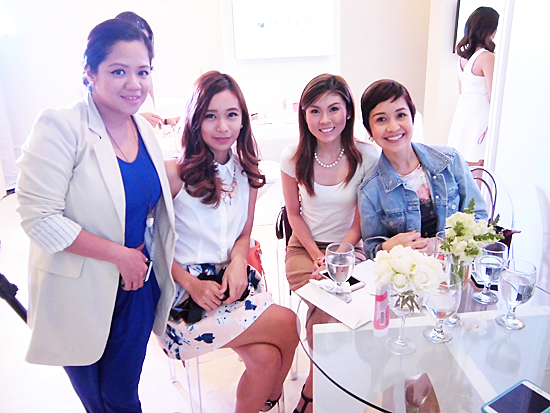 Meanwhile fellow blogger Tricia Gosingtion (center) says "I don’t have to worry about piling on heavy makeup anymore. Taking a perfect, effortlessly pretty selfie is as easy as washing my face with the new Pond’s Pearl Cleansing Gel." My event buddies that day! Shen from Shen's Addiction, Shari from The Misty Mom, Dior from Dior Co Makeup, and Julia from Bless My Bag. Taking its cue from history by infusing pearl essence, known for centuries to make skin fairer and brighter, the Pond’s White Beauty Pearl Cleansing Gel’s oxygenated formula is also what deep cleans skin while locking in all that essential moisture. The result? Skin that’s not only clean, but softer, brighter, and more supple. Its gel form doesn’t only guarantee a lighter texture, but it also means the cleanser’s essential properties dissolve faster and more effectively into the skin. At the end of the event, we all got to take home a generous amount of loot. Not only did we each receive two different sized tubes of the new White Beauty Pearl Cleansing Gel, but also a small tub of the Pond's Flawless White Dewy Rose Gel, a couple of Bobbi Brown products, Inglot eyeshadow, and a bottle of OPI gel polish. All of it packed into a customized, acrylic drawer set with our first name initials on it! Thank you Pond's Philippines! The new Pond’s Pearl Cleansing Gel will be available nationwide in all leading department stores, drugstores, supermarkets, groceries, and convenience stores this March, 2015 and SRP will be Php85.00 for 50g and Php185.00 for 100g.